My daughter just discovered Lego blocks today. 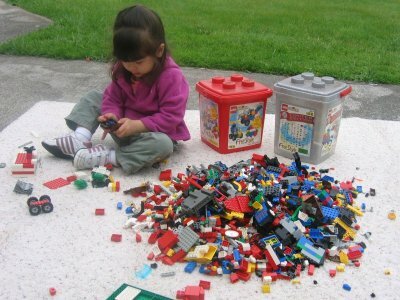 I have a few bins of them, and during our garage sale, I decided to pull them out and let her play with them on a piece of rug I layed out in our driveway. Incidentally, rugs are a great way to keep two-year-olds from spreading Lego blocks all across an entire driveway.